Inbound means K cars going toward Embarcadero Station. Outbound means K cars going toward Balboa Park. From Balboa Park, K operates on surface until West Portal, then continues underground to downtown under Market Street. 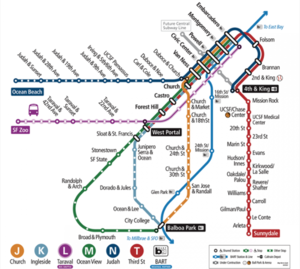 The K line is interlined with Third Street, which serves the eastern side of San Francisco. For inbound cars from SF Zoo, the signs change from K to T at West Portal Station and continue to Sunnydale Station via Downtown SF. For outbound cars to the Zoo, the signs change from T to K at Embarcadero Station and continue to Balboa Park Station. This route is often referred to as KT for timetables and real time information. Stops with a smaller dot are not wheelchair accessible. BART line and stations are in pink color. This page was last edited on 15 January 2019, at 20:27.